Avengers: Infinity War: Why Go. 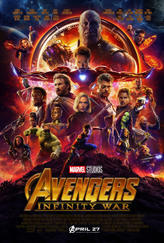 If you somehow still need convincing to go see 'Avengers: Infinity War' in theaters, here's several reasons why to buy your tickets for an epic 10 years in the making! Stars from 'Avengers: Infinity War,' including Tom Hiddleston, Anthony Mackie, Tom Holland, Benedict Cumberbatch, Winston Duke and Sebastian Stan, sit down with Fandango to reveal which castmate is most like an Infinity Stone. We ask the cast of 'Infinity War' how they reacted when their trailer dropped in front of the D23 Audience. Take a quick look at some of the most anticipated movies coming to theaters this summer! Looking for movie tickets? Enter your location to see which movie theaters are playing Avengers: Infinity War (2018) near you.